The man who solved Mitt Romney’s problems with conservative voters has spent his post-collegiate life in Washington, D.C. political jobs. He voted for the 2008 Troubled Asset Relief Program. He voted for the 2009 auto bailout. He voted for Medicare Part D, and has defended it robustly ever since. 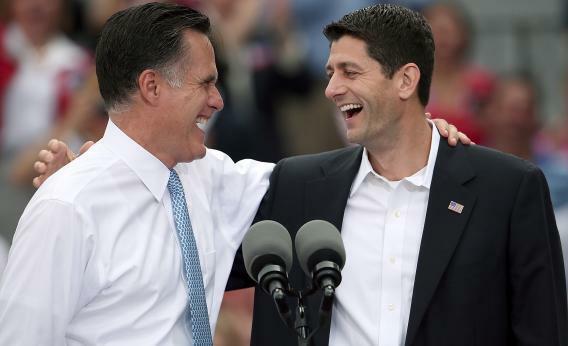 That confidence was built on Ryan’s record, sure, but the candidate’s charisma was even more important. Barack Obama grew his national, progressive following with some pleasant but detail-poor speeches about American diversity, then with speeches that called 2005 Republican entitlement reform ideas “social Darwinism.” He rarely had to defend himself in debates. Ryan, however, started to build his current following by showing up and out-talking Democrats. In February 2010, Ryan was picked as one of the GOP’s avatars at the president’s “health care summit” at Blair House. He said that health care spending was “driving us off of a fiscal cliff,” that Medicare was worth “$38 trillion in empty promises,” and then he challenged the math behind the president’s bill. It was a brilliant use of a format weighted against Ryan. Less than a year later, he’d give the Republican response to Barack Obama’s State of the Union, another thankless task. Many times since then, Ryan has bracketed Obama’s policy speeches by giving his own speeches that portray Republicans as people who’ve made hard choices, and Obama as a lying, incompetent showboater. One reason why this worked: Ryan constantly framed his plans as deficit reduction. He didn’t need to frame the president’s plans, really, because they obviously weren’t reducing the deficit. (Gimmicks like the 2010 extension of Bush tax rates, which Republicans wanted, helped prove their point.) The political press awards merit badges to anyone who talks about deficit reduction – especially if they’re clearly taking risks. In the spring of 2011, when Democrats ran against Ryan’s Medicare “premium support” plan and won a New York special election, what the media noticed was that Ryan didn’t budge. There was no House member scaredy-cat scramble away from the Ryan plan. Ryan used the next congressional recess to re-sell the plan, with charts and torrents of numbers, in Wisconsin town halls. And when Republicans won the next House special election, in Anthony Weiner’s seat, Ryan looked both bold and right. “We don’t need a president to tell us in what direction to go,” said Grover Norquist at this year’s Conservative Political Action Conference. “We know what direction to go. We want the Ryan budget.” It didn’t matter who was led the GOP’s ticket, because “we just need a president to sign this stuff.” And it won’t matter that Vice President Ryan would not be Budget Chairman Ryan. The congressman would behind an incredibly loyal caucus, with Republicans like Rep. Trey Gowdy, who admit they had asked Ryan to run for president himself and save the party (implicitly, from a weak Romney). The Ryan tone was sort of tough to distinguish in today’s launch event. I think that’s because Ryan’s plan had already been endorsed by Romney, as had Ryan’s characterization of Obama. “We will return work to welfare,” said Romney, even though it’s not really true that the new HHS welfare rules will let states take work out of welfare. But the over-arching argument is that Obama enriches people who work at the expense of people who donate, financed by borrowing. In his own short remarks, Ryan said that Obama’s Democrats were “more about the next election than the next generation.” When you start from that position, you start to pre-empt an argument about taxes – helpful, because Ryan’s flatter tax rates are based on the low rates and revenue return of the current Bush-era code. How you pay for government is secondary to what you’re paying for. If you want to pay for the current welfare state, you’re a fool, because no tax rates can support that state. By picking Ryan, Romney acknowledged that he can’t force the election to be a pure referendum on Barack Obama’s bad economy. It’s a choice between a state with more benefits and top-down wealth redistribution, and a state with leaner benefits and tax rates that favor the “makers” over the “takers,” to crib Ayn Rand. And Republicans have absolute confidence that the second choice is already winning, because Paul Ryan made it so.